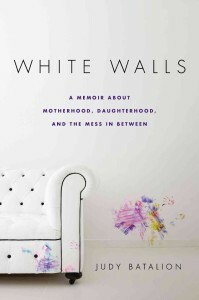 This is not a light book — the author chronicles her efforts to convince her father of the reality of her mother’s illness and commit her mother to a psychiatric word — but it is leavened by Batalion’s energy and humor: She refers to her baby’s internal kicking as “domestic abuse,” marvels at a special room for Jewish neuroses in a high-end NYC baby store where pre-purchased items are stored until after the baby is born — for superstitious parents; and describes a “Babies and Pets” workshop for expecting couples, where she and her husband are surprised to discover that they are the only couple more concerned about how their pet will adjust to the baby than vice versa. While living in England, she tried to make it as a stand-up comic, and even wrote her own one-woman show in which she played both her grandmother and her imagined daughter. “Judaleh,” she continues to hear her grandmother speaking to her long after her death; even though the voice she hears more often is that of her mother, whose suicidal phone calls send her running back home time and time again. Ilana Kurshan works in book publishing in Jerusalem. One twenty-something’s disability journey. Should the Jewish community fund fertility? Teaching gunhate to grandsons. A Sephardi polyglot chooses a language. When a woman friend dies. Hard to talk to your daughter about God. Can a feminist love a library?